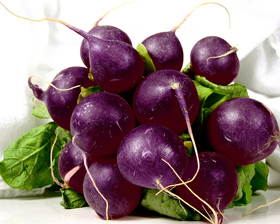 New introduction - Radish Malaga! Shiny deep purple skinned round roots with crisp white flesh. The roots of Radish Malaga are slow to go pithy and have strong tops for easier pulling. Ideal for containers. Sow regularly for continuous succulent roots throughout the summer. Harvest in 20-25 days. Sow radish seeds from March to August. Sow seeds thinly direct outside or in containers, 13mm deep.